Before we went out for Christmas dinner, my mom handed me a small bag stuffed with wrapping paper. I dug into it, expecting to find candy, money, or some mix of the two. 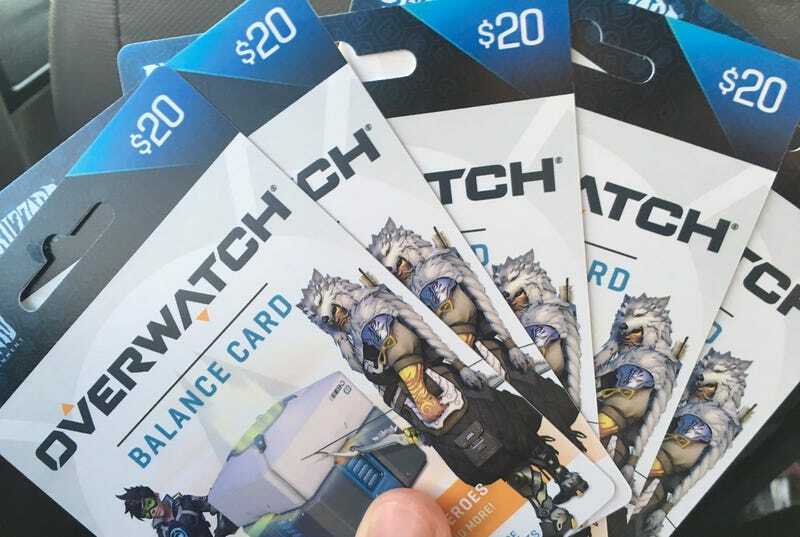 I did find those things, but also Overwatch loot box gift cards. I was ecstatic. A day later, however, I’ve realized that my mom unintentionally imprisoned me in Video Game Hell. Look at them. That’s enough to buy a lot of loot boxes! I might actually be able to get some skins I want with those suckers. Or at least save up enough in-game currency to buy them while feeling morally conflicted about feeding into a system I object to on the grounds that it actively makes the game less enjoyable to play. Whichever happens first. Today, though, I woke up and found myself faced with a question: When? When do I fork over my giant wad of (to the tune of “Love Shack” by the B-52s) loot box money in exchange for 124 of those insipid, wonderful boxes? While Overwatch is about to get an update that’ll make regular loot boxes a slightly more appealing proposition, seasonal events are still where it’s at. New skins, emotes, sprays, and other cosmetics come out, but for a limited time only. Then they go away for at least a year. It’s one of the most nefarious aspects of the loot box craze. You’re supposed to be able to earn credits for loot boxes through normal gameplay, without having to make a purchase. But the ticking clock on seasonal events suggests something else entirely. Either play until your WASD hand is a withered stump, or spend until the machine finally spits out the shiniest toy in the window. I’ve realized that there are plenty of good times to buy 124 Overwatch loot boxes, but no best time. Even if spring’s loot boxes miraculously give me the skin (or skins) I want, summer, fall, or winter’s crop of horrible gambler bait will inevitably contain a skin or emote I want even more. Understand, too, that I’m the kind of person who sometimes takes an hour to decide which $5-$10 food item to order on Grubhub. This is not an exaggeration! “Analysis paralysis” was my nickname in high school, or it would’ve been, if I could’ve decided on one. I know what you’re thinking: I should meter the gift cards out, maybe only redeem one per event or something. That sounds sensible on paper, but is in fact a fantastic way to make me spend several million dollars. See, if I only use one gift card per event, odds are very good that I won’t get any of the stuff I want. Already somewhat committed to that pursuit, I’ll then be tempted to sweeten this deal with the devil using a few of my own dollars. And then a few more. And then... well, you can probably see where this is going. Sometimes, the only way to win the game is to not play at all. On top of all that, Jeff Kaplan’s spent more time sitting motionless in front of a fire than he has releasing new legendary Pharah skins in 2017, and I’m now certain he’s doing it to spite me. He’s mocking me, literally lying in wait until I finally spend the in-game coins and, now, gift cards that I’ve accrued on something else before surprise-launching an update that gives Pharah 20 new skins and lasts 17 seconds. Maybe I should drive out into the wilderness and bury the cards, or give them to a wolf. Will that help me find peace, though, or will I always wonder what could have been? I’m beginning to think there’s no good solution to this dilemma. What I mean to say is, this is the gift that keeps on giving (me anxiety).